Level 1 Trainer Academy This Week! So… we’re on Day 2 of our first Academy for the year, where trainers come and spend six days here at Peaceable Paws. 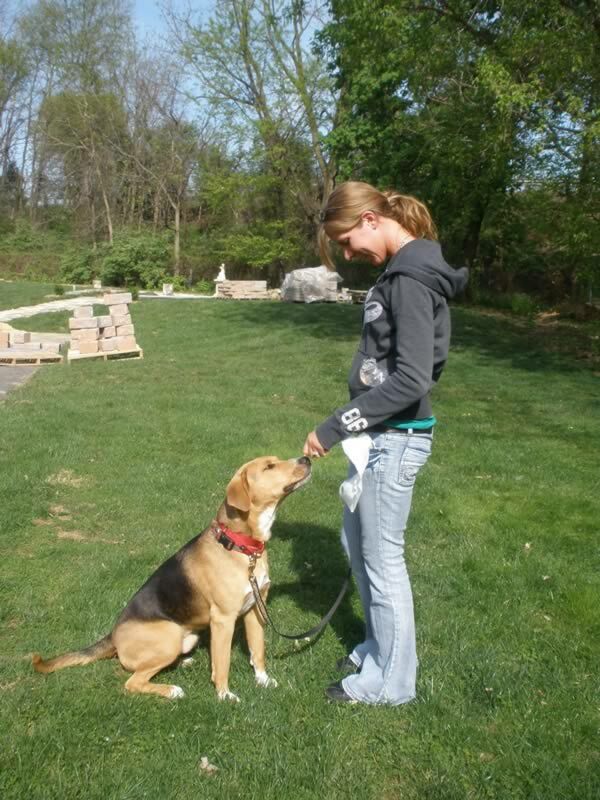 This is a Level 1 Academy – Basic Dog Training and Behavior. Students each select a dog from our local shelter (The Humane Society of Washington County) to work with for the week, and we go through our 7-week Basic Good Manners training in six days. It always astounds me to see the progress our students make with these dogs in just one week. As many Level 1 Academies as we’ve done (more than 25 since we started in 2002) you’d think I’d get used to it, but it seems like a new miracle every time. We also offer two Level 2 Academies (Behavior Modification and Instructor Course), a Level 3 Advanced Behavior and Training (this year for the first time) and lots of two and three-day workshops (Reactive Rover, Shaping, and Nose Games). You’ll get to hear about all of those as they come along. Vicky Hellerick and Curly – male Cockapoo, a little anxious, but first in the class to get his verbal down. 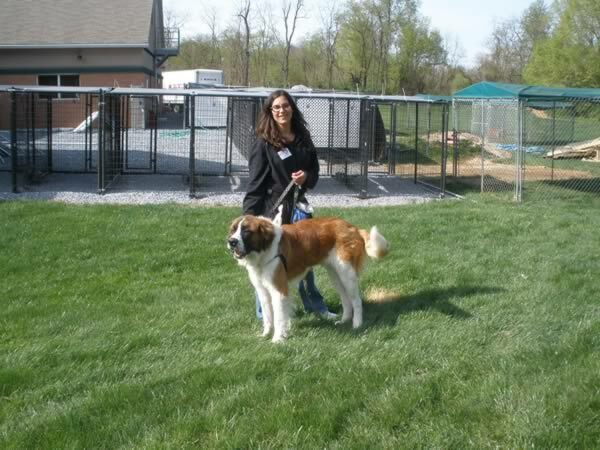 Leah Jordan and Charlie – absolutely wonderful St. Bernard. Petra Manis and Bean – sweet little Chihuahua boy, who sometimes panics on leash. Petra succeeded in getting a lured down with Bean today – a behavior that sometimes can be challenging for the toy breeds. 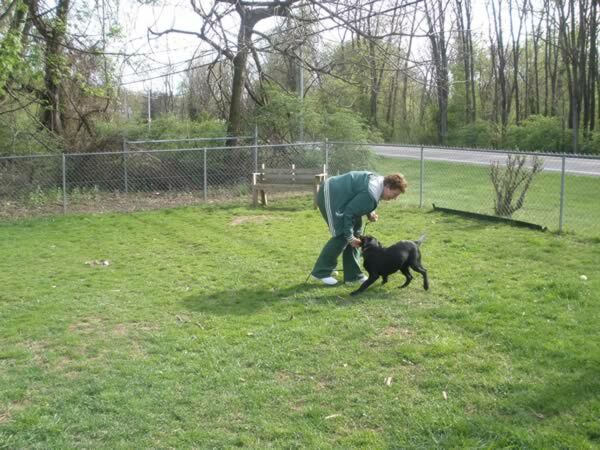 Trainer Ann Marie Easton also worked with Bean last week when she was here for a Private Intern week. Sue Romano and O’Malley – bouncy Lab kid who still has sharp baby teeth. Ouch! Sue got O’Malley to start doing verbal downs today as well. 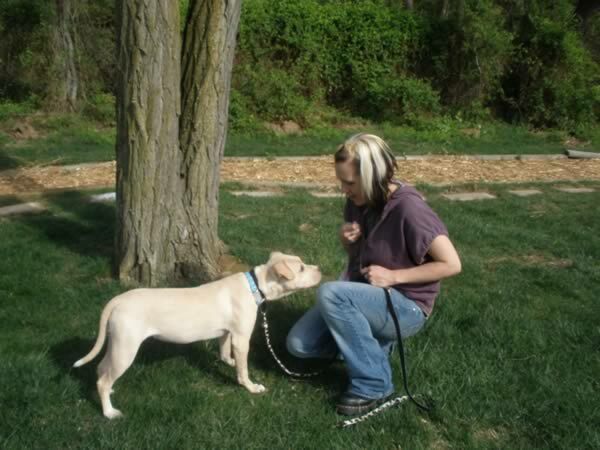 Sarah Matisak and Sweet Pea – perfect name for this quiet little Pit Bull. Sweet Pea also did her first verbal down today. Christy Crone and Taz – Shepherd/Hound? A little worried about the world, but doing really well in the Academy. 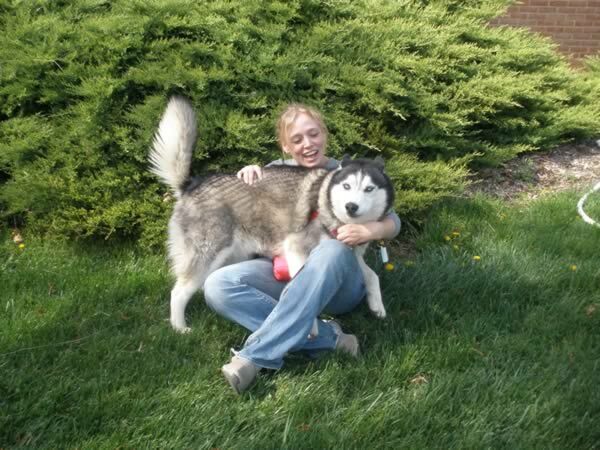 Kelly Spring and Lance – Beautiful Husky with two blue eyes; still a little distracted – hasn’t quite bought into the training game yet, but he’ll get it. 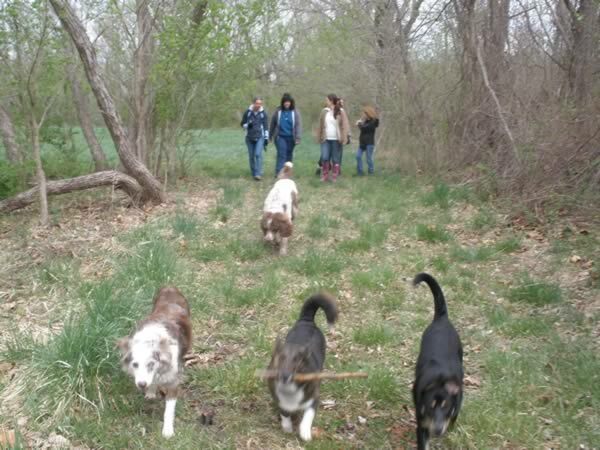 Dogs and students hike every morning for 45 minutes on our 80-acre farm before starting class – helps a lot with stress reductions for dogs and humans! Three training sessions each day, and a lot of discussion. Today’s topics: Stimulus Control; Reinforcement Schedules; Laws of Shaping; Behavior Assessments, and more. I’ll let you know how everyone does by the end of the week! Finally, last Friday we hosted the Spring MAAPPPT meeting here – the Mid-Atlantic Association of Positive Professional Pet Trainers. We did our annual dog pack hike, and shared thoughts about the unfortunate purchase of one of our favorite positive training product companies (Premier Products) by shock collar company Radio Systems. We are all sad and disappointed, and will be putting together a list for alternative sources for our favorite dog training products. Till next time… warm woofs and happy training!